The 2018 predicted peak of the Perseid meteor shower is the early morning of August 13 in North America. The distribution of meteors in the shower varies with the earth’s path through it. The prior or following day may be as good or better. 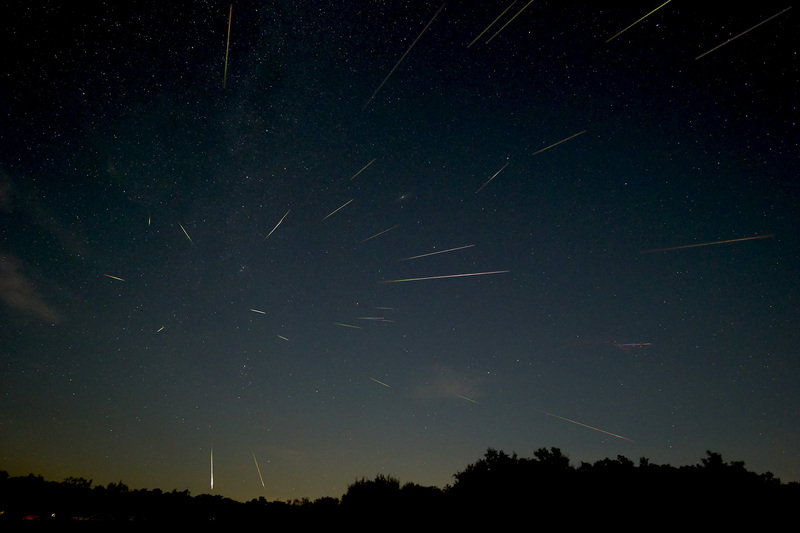 The Perseids in 2018 are an example of meteor shower planning that can be used with any meteor shower. No moon or a waxing crescent moon that will set before midnight. Dark skies far from urban light domes. High altitude, low humidity, transparent skies to see smaller meteors in much greater numbers. Observing after local midnight when your side of the earth will face into the approaching meteors. The shower radiant (center) is high in the sky. Some showers are best in the tropics, northern, or southern hemisphere. Luck, the stream of meteors isn’t uniform and the peak is hard to predict. I’ve observed one truly spectacular meteor shower when all of these elements came together. I take every opportunity to try to repeat that experience. a DSLR or mirrorless camera with a full frame or APS-C sensor and good low light performance. I use a Sony a6300 mirrorless camera. a wide angle (short focal length) fast lens to capture more sky and more meteors. I use a Rokinon f/2 12mm manual lens. a sturdy tripod. I’ll be using a sturdy light weight carbon fibre tripod so that I can hike to the best location. a memory card with enough capacity to store all your RAW images. With a 30 second exposure you will take nearly 120 images per hour. an intervalometer (either external or a camera app) to automate taking exposures all night long. I use Sony’s intervalometer app for my camera. an optional star tracking mount to keep the meteor radiant in position in your shots. I use a compact Vixen Polarie tracker. If you don’t use a tracker you will want to recenter your camera occasionally to keep capturing the same region of sky. an optional external battery for your camera and intervalometer. You will need your batteries to last most of the night. 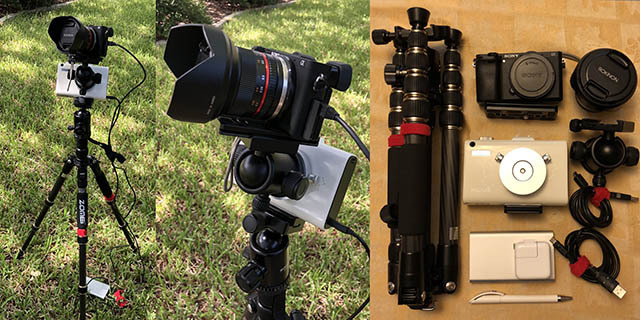 The kit above has everything you need to shoot meteor showers or Milky Way time lapse videos. With a dual output lithium batter pack, it can run the camera and the star tracker all night and the next day. If your camera doesn't have a intervalometer function or app, external ones are inexpensive. Find one that works with your camera, like the one below, with either a wired or IR camera trigger. This all fits easily in a day pack with room for water, a snack, and a jacket. Thirty second exposures work well. With only a second or so between exposures to write the image, they will miss few meteors. Longer exposures can work well, but are more likely to be spoiled by passing lights or other mishaps. Most cameras have 30 second exposures built in, makeing them easy to setup and automate with a simple timed trigger intervalometer. 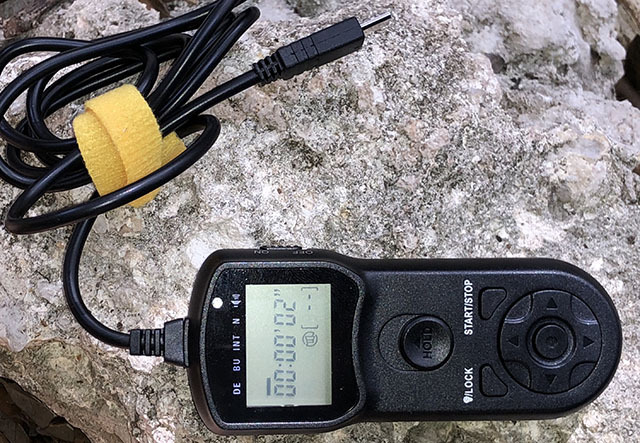 If you don't have an intervalometer, a remote shutter release will work. You may get tired and not enjoy the overall experience as much. You may have to decrease the exposure time or because of light pollution. Take some test shots and adjust before you start your timed exposures. You will want the widest angle, fast lens that you have. The shorter the lens focal length, the more meteor trails that you will capture. I use a Rokinon 12mm f/2. It’s fine to back off exposure a stop from the maximum, if you prefer a sharper image. Choice of ISO depends on your camera's low light and dynamic range performance. Many meteor trails are quite bright. If they are not overexposed you can see the color range from blue to red as they burn up in the atmosphere. There are also dim meteors and features like the Andromeda Galaxy that can show up in your images if you have sufficient sensitivity. ISO settings of 400 to 3200 can work well depending on your camera, lens aperture, and sky conditions. Remember that an individual meteor trail only lasts a second or so. Longer exposures and lower ISO gain will make the meteors appear dimmer with respect to the stars. Make sure your camera is set to take RAW format images, or the highest quality JPEGs if it cannot. RAW images will allow you to adjust exposure for the best results in post processing. Make sure you are comfortable using your intervalometer. The shot repeat rate will need to be a second or so longer than the exposure time to give the camera time to write the image to the memory card between shots. I like to tell the story of the entire meteor shower in a single image, as in this one from the 2016 Perseids. The radiant is the central source of the diverging meteor trails, capturing the source of this stream of space debris. A twilight image of the horizon can capture the atmosphere of your location. Go with your interests and strengths in making your own image plan, but have it in mind so that you get all the shots you need. I like to setup in a dark location with a good landscape foreground for the final image. I will shoot some exposures at dusk as the first stars are coming out. I position the landscape as I want it in the final image. I start my tracker after these shots to keep the later stars and meteors true to the sky position in my location. After it gets dark I’ll check my exposure and focus, start up my intervalometer, and let it run through the night. When you frame your shots, think about where you want the meteor shower radiant in the final image. I frame my shots with the radiant to one side of the center of the image. This captures both the radially diverging trails from the central radiant and some of the longer trails further from the radiant. Picking the landscape foreground for your image requires scouting. Scouting also identifies obstructions such as hills, buildings, signs, and lights that can interfere with the shot. Your goal is to identify a specific spot to set up for your images. This is best done in person, but there are excellent tools that can help you prepare and if necessary substitute for a scouting visit. Google and Apple maps can provide distance and elevation information. Park maps show trails and will help identify areas accessible at night. Tools like Google Streetview or Flickr images can give point of view images. 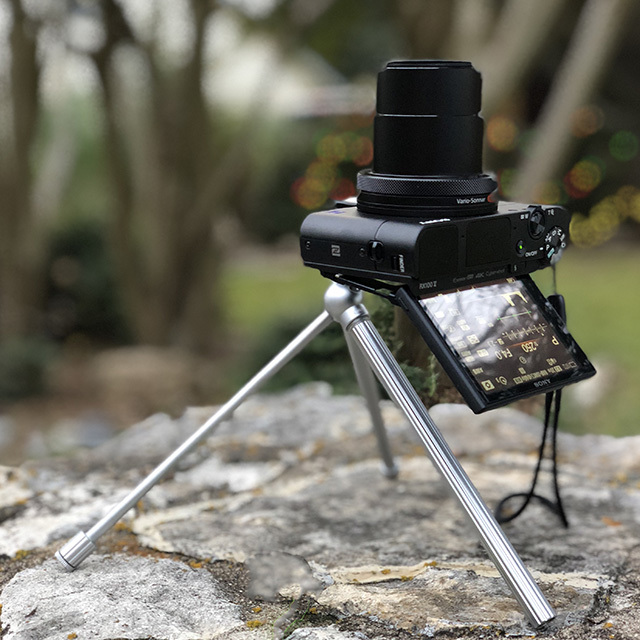 There are also applications like the Photographer's Ephemeris and PhotoPills are helpful especially with rise and set times and lines of sight to the sun, moon, and Milky Way. Using these tools I identified the Enchanted Rock Loop Trail trail head area as accessible and giving a profile view of the Little Rock with the Perseids. Another good location is along the Loop Trail between the Gazebo and the Frog Pond which will silhouette Big Rock and Turkey Peak below the Perseid radiant. I checked with the park and Enchanted Rock requires a camping permit to remain at night. I was told that although the rocks are off limits photography from near the Loop Trail is OK.
Meteors will appear to come from the direction of the radiant, but may appear all over the sky. Planetarium programs, almanacs, or news articles will give the radiant location. I find it useful to use a planetarium program such as SkySafari to preview the sky at key times during the meteor shower. I set the reticle to show me the field of view of my camera. While your camera snaps away automatically, you can enjoy the shower with your own eyes. About 30 degrees away from the radiant towards the zenith is a good place to start looking for meteors. A blanket or reclining chair will keep you comfortable. Meteors will be become more frequent after local midnight (about 1:40 AM in central Texas), because the earth’s rotation will swing us to the side facing the approaching meteors. A star tracking mount will keep your shots framed. If you use a fixed tripod, you may want to schedule times to re-frame your shot to catch the most possible meteors. Using the times from the 2018 Perseids in central Texas: Foreground landscape exposure between sunset at 8:20 pm and civil dusk at 8:44 pm. Get some good clean low noise exposures. You can adjust the exposure and mask the brighter sky when you combine this with your meteors in post processing. If you use a tracking mount, after polar aligning it, position it with the radiant in your field of view at the azimuth of the radiant at dusk. For the 2018 Persieds this is 17 degrees east and 3 degrees above the horizon at dusk. A compass or pre-calculated landmark is helpful. Because of the wide field of view, exact polar alignment isn't critical. If needed, you can fine tune the alignment when the sky is fully dark. Start your intervalometer taking images after astronomical dusk or wait until after midnight if you are concerned about battery life or image storage. 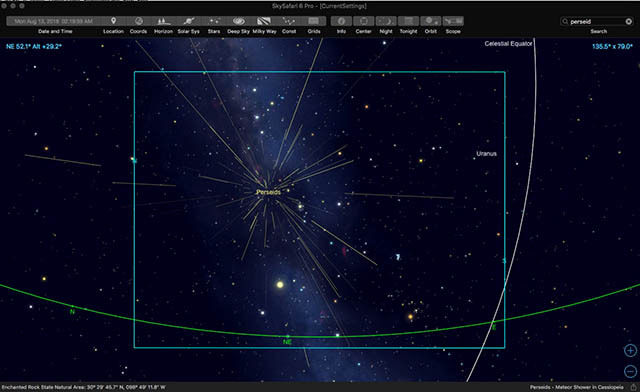 With a tracking mount, an exact polar alignment isn’t mandatory because you will be using a very wide lens and you can align your meteor images exactly using bright stars in the images. Once you have your shot framed, you can turn on your intervalometer and let it do the work. You may want to check and adjust your shot framing as needed, if you don't have a reasonable polar alignment or are not using a tracker. If you didn’t use a tracker, there will be lots of drift between images and you will have to match rotation and translation with a two star alignment. As long as a meteor trail on an aligned image is in your final field of view you can use it. Each meteor trail will be positioned accurately against the sky in the final image. In post processing I align all the images. I’ll then pick a series of them without meteors to stack together for a low noise sky background layer. I next go through all the aligned images and pick out the ones with meteor trails. Each of these I mask to keep only the meteor trail and stack these over my sky background. If necessary I adjust exposure of the meteors. The result is a composite equivalent of a single exposure that lasts the entire night. This final composite will not have any passing airplanes or stray headlights! After building a composite of all of the meteor trails and background stars, you can add your twilight landscape foreground shot to the stack to tie your image to the location. Use the bright stars visible at twilight to align to your stacked image of the meteors. Some artful masking and exposure control will combine the meteors from the entire night with the landscape and sky at twilight. The result is an entire night of meteor observing accurately compressed into a single image.